All fashion lovers around the world instantly recognise the super sky scraper hidden platform Balenciaga boots as worn by Nicole Richie back in 2008. 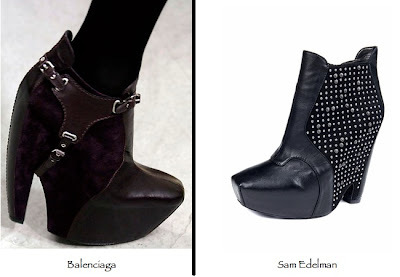 Sam Edelman created his own version of the Balenciaga booties known as the 'Zoe' boot and they were a massive sell out. The Sam Edelman 'Zoe' boot has now evolved! Sam Edelman has created the 'Zoyla' hidden platform heels boots, A Younger sister to the Zoe boot but with a new studded twist these heels are so Twenty Ten! - They are most definitely a closet essential for all Nicole-ettes!